An unexpected discovery has led to a rechargeable battery that’s as inexpensive as conventional car batteries, but has a much higher energy density. The new battery could become a cost-effective, environmentally friendly alternative for storing renewable energy and supporting the power grid. A team based at the Department of Energy’s Pacific Northwest National Laboratory identified this energy storage gem after realizing the new battery works in a different way than they had assumed. The journal Nature Energy published a paper today that describes the battery. After years of focusing on rechargeable lithium-ion batteries, researchers are used to thinking about the back-and-forth shuttle of lithium ions. Lithium-ion batteries store and release energy through a process called intercalation, which involves lithium ions entering and exiting microscopic spaces in between the atoms of a battery’s two electrodes. This concept is so engrained in energy storage research that when PNNL scientists, collaborating with the University of Washington, started considering a low-cost, safe alternative to lithium-ion batteries – a rechargeable zinc-manganese oxide battery – they assumed zinc would similarly move in and out of that battery’s electrodes. After a battery of tests, the team was surprised to realize their device was undergoing an entirely different process. 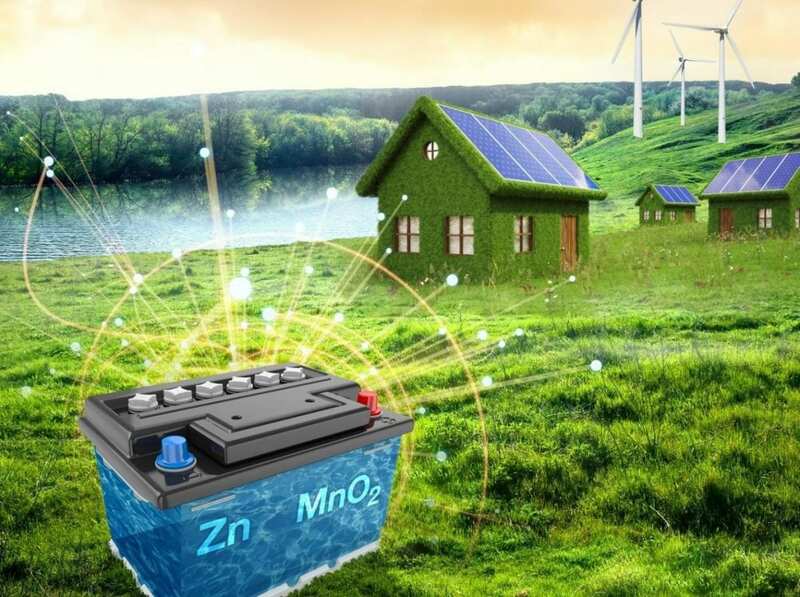 Instead of simply moving the zinc ions around, their zinc-manganese oxide battery was undergoing a reversible chemical reaction that converted its active materials into entirely new ones. Liu and his colleagues started investigating rechargeable zinc-manganese batteries because they are attractive on paper. They can be as inexpensive as the lead-acid batteries because they use abundant, inexpensive materials (zinc and manganese). And the battery’s energy density can exceed lead-acid batteries. The PNNL scientists hoped they could produce a better-performing battery by digging deeper into the inner workings of the zinc-manganese oxide battery. So they built their own battery with a negative zinc electrode, a positive manganese dioxide electrode and a water-based electrolyte in between the two. They put small, button-sized test batteries through the wringer, repeatedly charging and discharging them. As others had found before them, their test battery quickly lost its ability to store energy after just a few charging cycles. But why? To find out, they first performed a detailed chemical and structural analysis of the electrolyte and electrode materials. They were surprised to not find evidence of zinc interacting with manganese oxide during the battery’s charge and discharge processes, as they had initially expected would happen. The unexpected finding led them to wonder if the battery didn’t undergo a simple intercalation process as they had previously thought. Perhaps the zinc-manganese battery is less like a lithium-ion battery and more like the traditional lead-acid battery, which also relies on chemical conversion reactions. To dig deeper, they examined the electrodes with several advanced instruments with a variety of scientific techniques, including Transmission Electron Microscopy, Nuclear Magnetic Resonance and X-Ray Diffraction. The instruments used were located at both PNNL and the Environmental Molecular Sciences Laboratory (EMSL), a DOE Office of Science user facility located at PNNL. Combining these techniques revealed manganese oxide was reversibly reacting with protons from the water-based electrolyte, which created a new material, zinc hydroxyl sulfate. Typically, zinc-manganese oxide batteries significantly lose storage capacity after just a few cycles. This happens because manganese from the battery’s positive electrode begins to sluff off, making the battery’s active material inaccessible for energy storage. But after some manganese dissolves into the electrolyte, the battery gradually stabilizes and the storage capacity levels out, though at a much lower level. The team used the new knowledge to prevent this manganese sluff-off. Knowing the battery underwent chemical conversions, they determined the rate of manganese dissolution could be slowed down by increasing the electrolyte’s initial manganese concentration. So they added manganese ions to the electrolyte in a new test battery and put the revised battery through another round of tests. This time around, the test battery was able to reach a storage capacity of285 milliAmpere-hours per gram of manganese oxide over 5,000 cycles, while retaining 92 percent of its initial storage capacity. The team will continue their studies of the zinc-manganese oxide battery’s fundamental operations. Now that they’ve learned the products of the battery’s chemical conversion reactions, they will move on to identify the various in-between steps to create those products. They will also tinker with the battery’s electrolyte to see how additional changes affect its operation.